In need of a little midweek meal inspiration? Want to eat delicious food, but don’t want recipes that take too long or are tricky to make? These 20 Delicious and Hassle Free Midweek Meal Ideas are perfect to get you out of that midweek meal planning rut! January always seems a little flat after the exciting rollercoaster that is December and especially in the cooking department. We all go a bit mad in December, cooking things we never normally make and stuffing ourselves silly, and then January ticks round and it’s like all the foodie inspiration has been used up and suddenly meal planning is a chore again. But it needn’t be so! Here are 20 Delicious and Hassle Free Midweek Meal Ideas that are certain to get your taste buds excited again, but without the stress – almost all of these recipe ideas take under an hour from start to finish and none of them involve more than 30 minutes hands on time – many a lot less!! This easy peasy pilaf takes less than 30 minutes to make and only uses one pan, yet tastes incredible. Perfect for busy days! Deliciously simple, this Easy Sicilian Style Tuna Pasta is my easy peasy take on the traditional Italian dish of Pasta Puttanesca. Takes 20 minutes. A simple, quick and totally tasty lamb recipe, this Lamb Keema Biryani is a perfect midweek meal for when time is tight, but delicious enough for the weekend too. Takes 30 minutes. This meal is really simple to make, fry up some chicken and mushrooms, boil some pasta and broccoli and throw it all together with some crème fraiche and sweetcorn – DONE, and in well under 30 minutes – more like 20 if you get your skates on! A delicious mixture of beans, pasta and root vegetables, this Tuscan Bean Stew is inspired by my student travels and perfect for an easy midweek supper. Takes 45 minutes. This simple Sausage, Squash, Apple and Sage Traybake is full of flavour, yet only takes a few minutes to throw together and into the oven. Perfect for busy midweek evenings! Total time 1 hour. Liven up a dull weekday evening with an exciting and colourful Mexican feast! Inspired by a visit to Wahaca, these easy peasy tacos can be made using turkey or chicken and are super tasty, plus so much fun! Takes 30 minutes. This tasty vegetarian curry makes a great midweek meal, for when time is tight – it’s also a fab recipe for using up any leftover veg you might have lurking in the back of your fridge! Takes 30 minutes. Salty ham, sweet peas, earthy sprouts and oozing with cheese – this recipe is your new favourite midweek meal. It’s a great way to use up leftovers or can be made from scratch using bacon, fresh sprouts and frozen peas – it will taste fabulous either way – comfort food at its finest! Takes 30 minutes. An easy peasy twist on a classic, this Chicken Chilli Con Carne is easy, healthy and totally delicious – plus it can be made in under 30 minutes! An unusual twist on an Anglo Indian classic – my delicious and oh so easy Chicken Tikka Masala Traybake takes just a few minutes to throw together and then the oven does the rest of the work – my kind of dinner! Total time 55 minutes. Continuing my obsession with one pot rice dishes, this Wild Mushroom, Squash and Spinach Pilaf is one of my new favourite meals. It’s easy, totally delicious and just a touch unusual. A great way to jazz up your midweek meal routine. Plus it takes just 30 minutes to make and only uses 1 pan! All the delicious flavours of ratatouille are sneaked into this simple pasta dish. Hidden Vegetable Ratatouille Pasta is perfect for getting vitamins into little fusspots or for when you fancy a more flavoursome tomato pasta sauce. Takes 30 minutes. A show stopping main that takes less than 45 minutes to make and only uses one pan! Easy peasy enough to make on a weeknight but impressive enough for a dinner party. Delicious tagliatelle pasta coated in a creamy blue cheese and spinach sauce and ready in the time it takes to cook the pasta – perfect for busy midweek evenings! Originally conceived as a way of using up leftover ham, this tasty and healthy salad would be a great way of using up any leftover roast meats, especially roast chicken or turkey. Cooked salmon would also work well here. Plus, drizzled with an incredible honey, mustard and balsamic vinegar dressing, it tastes insane. For a veggie version switch the ham for quinoa and add a sprinkling of pumpkin seeds. Hands on time 15 minutes. Total time 50 minutes. Looking for inspiration for #Veganuary? Or just want to eat a bit more healthily in 2017? This Thai Red Tofu and Sweet Potato Curry is packed with delicious spices and healthy vegetables and can be on the table in under 30 minutes. Hearty and warming, so totally perfect for this time of year. This lamb stew takes a little longer than the other recipes but for most of the time it barely needs any attention. Make a double quantity and stash it in the freezer for an almost instant meal next time. Total time 1hour 55minutes. This Butternut Squash Macaroni Cheese recipe is so super easy – it takes well under 30 minutes and doesn’t involve making a roux, plus it’s a deliciously sneaky way of getting 1 of your 5 a day – perfect for fussy eaters! Takes 20 minutes. Have you made any of these recipes? 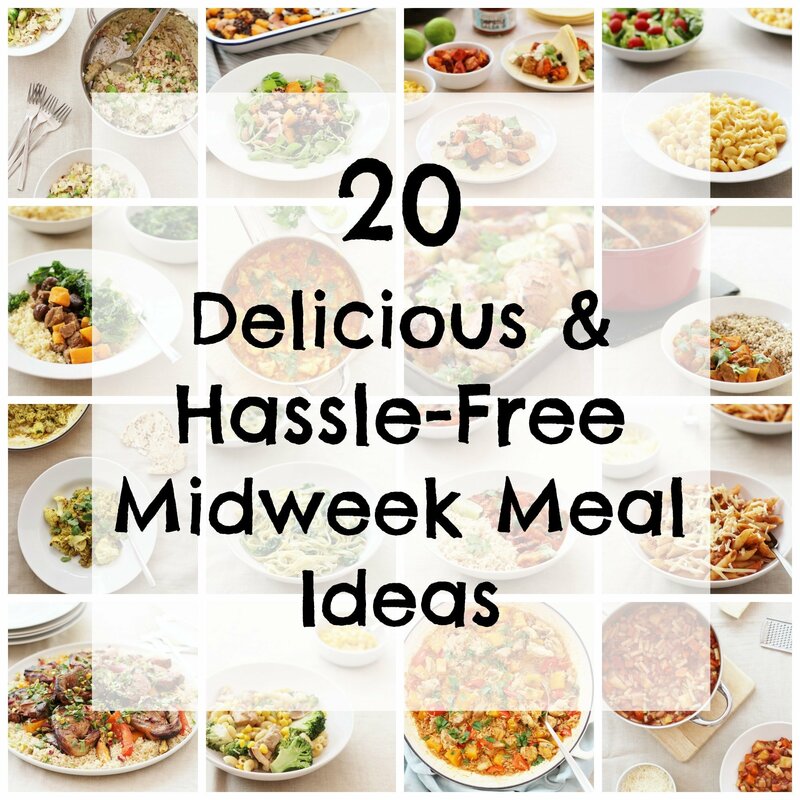 If you make any of these 20 Delicious and Hassle Free Midweek Meal Ideas I would love to hear about it!! Let me know in the comments below, or tag me on Twitter or Instagram – @easypeasyfoodie, using the hashtags #easypeasyfoodie and/or #midweekmeals. Want more easy midweek meal ideas like these? Follow me on Twitter, Facebook and Instagram. Or why not subscribe to the blog and get delicious, stress free recipes straight to your inbox every week?